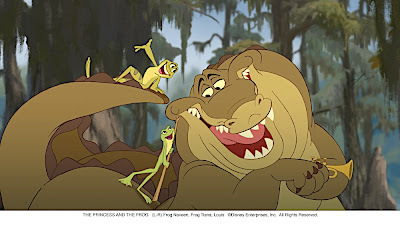 Walt Disney Home Entertainment's return to two-dimensional hand-drawn animation is as gorgeously lush, ambitiously epic in scope and authentic to the jazz era of New Orleans as you might expect from the dazzling directors of Aladdin and The Little Mermaid. 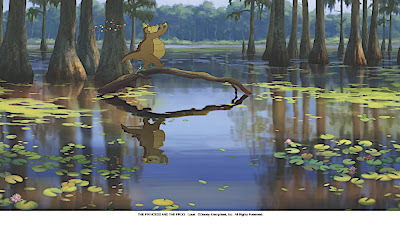 Filled with a flawless attention to architectural detail and a nostalgic golden color palette that illuminates everything onscreen to a nice magic hour glow, The Princess and the Frog will captivate you from the start, once more in the finale and would've been able to thrill you the whole way through had it not been for the decision set everything in between in the swampy creature filled Louisiana Bayou. Taking the sensuous splendor of the rich recreation of the Big Easy and then shoving it aside in favor of unappealing muddy hues, you can't help thinking that Frog buried what could've been its first wholly successful independent minded genuine romantic comedy (all princesses aside), not to mention its first film to feature a primarily African-American cast through the rather unfortunate story selection and gimmick switch of having the beautiful woman who kisses a frog turn into a frog as well. While admittedly, the Disney Princesses line has been changing with the times in ensuring that the studio's famous lovely ladies do more than speak less than twenty words (as in Sleeping Beauty) by gradually giving the heroines much more to do than sit around and wait to be rescued, the best thing about this particular “princess” is precisely that she isn't a princess... or at least not at the beginning. 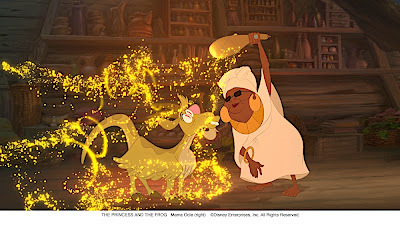 Instead of a tiara, the strong-willed, hard-working dreamer Tiana (voiced by Dreamgirls star Anika Noni-Rose) is setting her sights on saving enough money in tip jars waitressing and catering to open her very own restaurant to commemorate the honor of her father (Terrence Howard) and his famous gumbo. 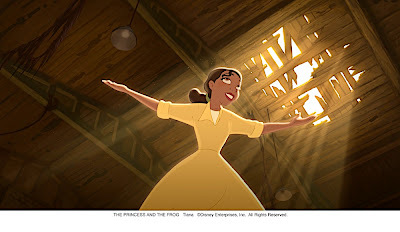 After being hired for her friend's elegant dinner party and reception for a visiting prince, Tiana finally has the amount she needs to put her plan into action, purchasing an old fixer upper location to become an official small business owner. 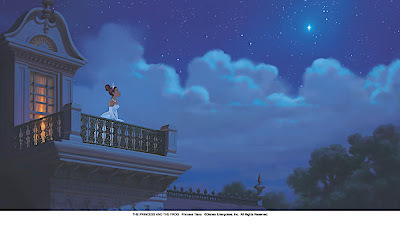 It's Tiana's can-do, girl-power spirit that makes her the first Disney heroine to truly inspire young women to do more than wait to be kissed and live happily ever after following a spellbound slumber. 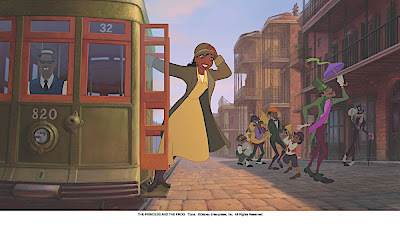 And although I loved the musical accompaniment of rollicking jazz era tunes by Randy Newman, part of me wondered if this movie-- one of the few Disney efforts to be set in the United States-- may have been even more groundbreaking if it was set in modern day New Orleans, all frogs and princesses aside, to remind Americans everywhere when we really need it that it's okay to still pursue the American dream, go into business and establish a sense of community. 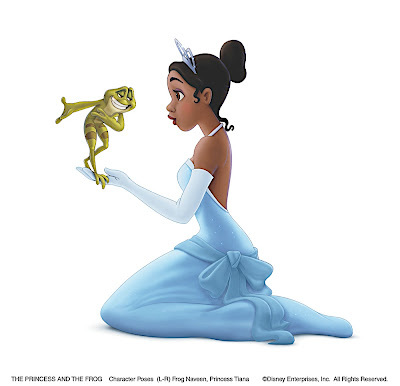 Yet, I certainly can't fault the movie for that as any change in the right direction is a positive in my book but this all goes away much too quickly when Tiana finds herself changed into a frog right along with the frog-prince she kisses as they go hopping around the swampland in a classic hero's journey complete with villains, shape-shifters, sidekicks, and new problems in each act and look for the right voodoo Mama who can turn them back into human beings before Tiana loses her dream restaurant for good to the highest bidder. Nicely keeping the love story in the background to unfold a bit more naturally than a “love at first sight” Disney tradition in favor of the tried and true love/hate rom-com approach, while we go with the turn of events for a little while, by the time twenty minutes have gone by and we're still stuck in the swamp filled with ugly creatures and unattractive animation that looks nowhere near as detailed, bright or original as the New Orleans background cells, I realized that my mind had begun to wander. Going into “fix-it” mode by trying to figure what went wrong instead of “transfixed” mode in celebrating just how much was going right, while sure enough the film does rectify itself in the overly succinct finale, I still can't imagine young girls being nearly as excited to spend the majority of roughly one hundred minutes in the bayou as opposed to going “Under the Sea” with Ariel's Little Mermaid or signing up to “Be Our Guest” at the Beast's mansion in Beauty and the Beast. 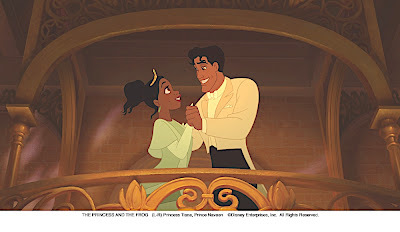 Of course, it was refreshing to see the colorblindness of the movie in terms of Tiana's white friend having a crush on the black prince and the black heroine go into business at a time when it was rare for women let alone African-Americans to do just that. 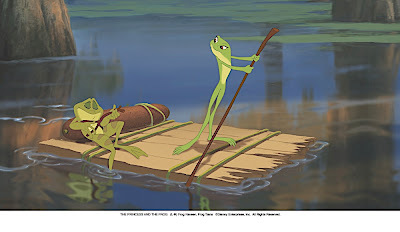 However, for the first major effort wherein African-American actors get to do more than play a villain or a comical sidekick, it was still unfortunate to see the House of Mouse look for an easy way out by spending more time turning the characters from black individuals to green frogs and less time endearing the audience to them as human characters. 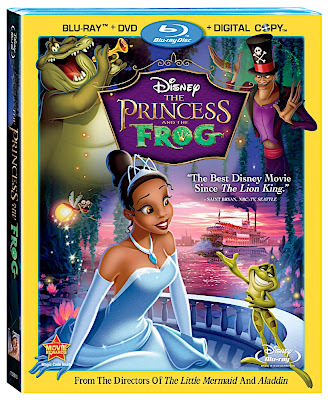 And while it certainly demands a high level of admiration and esteem for its unique introduction and marvelous New Orleans animation that sparkles on both Blu-ray as well as the DVD that's included in the three disc pack, overall, the movie only earns a mild recommendation as a noble experiment that's ultimately too flawed to watch as often as you will other titles in the Disney Princesses line. Intriguingly-- despite its title which some insiders were using as blame for the reason it didn't attract young male audience members-- once you see the film, I think you'll agree that even in the crystal clarity of HD where the music turns your family room into a Dixie jazz club, surprisingly this Princess may actually appeal more to young princes than princesses due to its cast of creatures and replacement of an inviting restaurant with a muddy swamp.